J Clin Invest, 2014, 124(4): 1646-59. Y-27632 2HCl purchased from Selleck. At day 8, cells were replated onto Matrigel-coated Transwell membranes at 106 cells/cm2 in the presence or absence of 10 mM Y-27632. TEER was measured at day 10, 2 days after replating. Science, 2017, 3(11):e1701679. Y-27632 2HCl purchased from Selleck. YAP nuclear localization in fibroblasts treated with PRP-Exos was blocked by Y-27632 2HCl. Scale bar: 50 μm. Theranostics, 2017, 7(1):81-96. Y-27632 2HCl purchased from Selleck. Effect of mechanical strain on cell morphology. (A) SEM analyses indicate that strain-induced cell elongation is prevented by treatment with HA1100 and Y27632. (B) Quantification of cellular area in the indicated conditions (n = 20). (C) F-actin staining of control, strained and HA1100 or Y27632-treated cells attests that inhibition of RhoA/ROCK prevents mechanical strain-induced cell elongation. *p < 0.05 compared to control without strain (CTL). J Mol Cell Cardiol 2014 67, 49-59. Y-27632 2HCl purchased from Selleck. The Rho GTPase-JNK pathway is required for the inhibitory effects of vandetanib on Calu-6 cells invasion. Calu-6 cells were incubated for 24 h in the presence or absence of vandetanib (1 or 2 uM), SP600125 (50 or 100 uM), and Y27632 (5 or 10 uM). The morphology of the Calu-6 cells was examined under a light microscope. Scale bar: 50 um. Mol Neurobiol 2015 10.1007/s12035-014-9084-z. Y-27632 2HCl purchased from Selleck. Dev Biol 2012 370, 33-41. Y-27632 2HCl purchased from Selleck. Uehata M, et al. Nature, 1997, 389(6654), 990-994. Itoh K, et al. Nat Med, 1999, 5(2), 221-225. Bito H, et al. Neuron, 2000, 26(2), 431-441. Watanabe K, et al. Nat Biotechnol, 2007, 25(6), 681-686. Hyvelin JM, et al. Circ Res, 2005, 97(2), 185-191. Ishizaki T, et al. Mol Pharmacol. 2000, 57(5), 976-983. Isler D, et al. Pharmacol Rep. 2014, 66(1), 114-120. Is there any data about the Amax (maximum attraction luminosity) and extinction coefficient of this compound? The wavelength we used to test HPLC is 260nm while the extinction coefficient is unknown. Could this product be used in cell culture? Do you have any reference for this application? Yes. The Y-27632 can be used in cell culture certainly. Here is the reference website: http://molpharm.aspetjournals.org/content/57/5/976.full. Fasudil (HA-1077) HCl : ROCK-II-selective, Ki=0.33 μM. 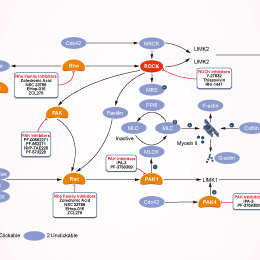 Fasudil (HA-1077) HCl : Phase III for scleroderma. RKI-1447 : Highly potent inhibitor of ROCK1 and ROCK2, with IC50 of 14.5 nM and 6.2 nM, respectively. 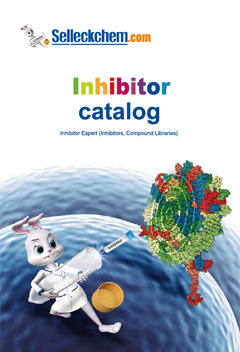 Features:The first reported Wee1 inhibitor.